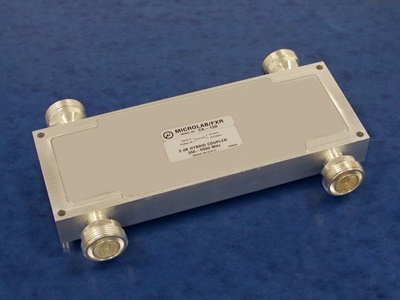 Announcing the addition of new Super Wide Hybrid Combiner offering coverage from 350 to 6000 MHz. This broad coverage has been achieved using stripline design techniques that ensure minimum loss and guaranteed low Passive InterModulation, PIM, up to 200W. The CA-13 will likely most commonly be used as the final combiner in neutral-host in-building systems where the ability to combine complex multiband signals with isolation, on two signal paths without complex filtering, is essential. The dissipative loss from the hybrid is minimal and usually both outputs may be employed for different parts of the coverage area. Units are moisture sealed to IP65 for use indoor applications and may be ordered to IP67 for outside requirements. The super-wide Hybrid Combiner is available for immediate evaluation from Microlab/FXR and selected distributors. For complete details call 'Sales' at Microlab/FXR on (973) 386-9696 or check the Internet at www.microlab.fxr.com.